Jihadi magazines have a long pedigree, are the subject of extensive media coverage and scholarly analysis, and are still easily accessible online. This post addresses attack-related information, including instructional content, contained in IS’s Rumiyah (Rome in Arabic) magazine in the period December 2016 – November 2017. IS’s Dabiq magazine was replaced by a new flagship publication, Rumiyah, from September 2016. Ten issues of the latter were released by Al-Hayat Media Centre, an officially recognised IS media outlet specialising in propaganda in languages other than Arabic, in the above period. These appeared on a monthly basis from December 2016 (Iss.4) to September 2017 (Iss.13), not just in English, but in c.10 other languages, including French, German, Russian, and Turkish. Worth noting here is, unlike Dabiq, large portions of Rumiyah were translations of articles published previously in Arabic in IS’s al-Naba’ weekly ‘newspaper.’ The non-appearance of Rumiyah in October 2017 for the first time since its launch in September 2016 coincided with the fall of Raqqa; no new issues have appeared since. Also no new issues of IS’s dedicated French-language magazine Dar al-Islam were published in 2017. On the other hand, the group’s weekly Arabic-language newspaper al-Naba’ has continued to appear. Supporters are also reminded of the simplicity and powerfulness of knife attacks in the same issue. It presents the case of an attack on a Russian military base in Grozny, Chechnya, where the knife-wielding attackers managed to seize the soldiers’ weaponry. It is emphasised that if overrunning a military base using knives is possible, how much easier it would be to carry out knife attacks in public settings in most Western countries. The US, Europe, Canada, the UK, and Australia are explicitly mentioned in this context. Generally, in the magazines, IS have tended to limit the extent to which they call upon supporters to target particular countries, locations, and landmarks. Focusing, instead, on the types of attacks preferred is probably, in part, a strategy to retain scope to claim attacks as they happen. The magazines therefore focus on specific target sites largely in the context of past events, such as the December 2016 Berlin Christmas market and August 2017 Barcelona attacks—an infographic about which is included in Issue 13 of Rumiyah—rather than call for targeting of specific locations in future attacks. Their emphasis in these publications is on inspiring followers to carry out attacks wherever they happen to live, but also providing some specifics in terms of tangible instructional content that can be useful generally. Having said this, the most recent issue (Iss. 13), mentions the White House, the Kremlin, and London as favoured targets. Also, whilst not directly calling on jihadis to strike the European Central Bank headquarters in Frankfurt, a photo of the ECB is included in Issue 11 (July 2017) with a caption calling jihadis to “strike the economies of the kuffar.” Consistent with the general inspirational emphasis of the magazines, the countries most likely to be mentioned in conjunction with instructions in 2017 were the US, France, and Britain, which were also the countries most mentioned overall per figure above. It is important to note that the approach adopted in the magazines is distinct from that espoused in semi-official and ‘fan’ content, which can be very specific as regards preferred targets, some going so far as encouraging targeting of named individuals. See, for example, Brandon Colas. 2017. ‘What Does Dabiq Do? ISIS Hermeneutics and Organizational Fractures within Dabiq Magazine.’ Studies in Conflict & Terrorism, 40(3): 173-190; Julian Droogan and Shane Peattie. 2017. 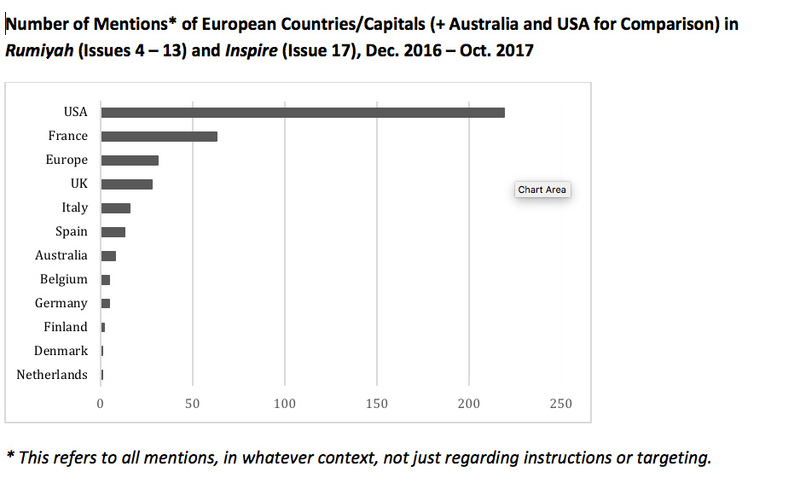 “Mapping the Thematic Landscape of Dabiq Magazine.” Australian Journal of International Affairs, 71(6): 591-620; Haroro J. Ingram. 2017. ‘An Analysis of Inspire and Dabiq: Lessons from AQAP and Islamic State’s Propaganda War,’ Studies in Conflict & Terrorism, 40(5): 357-375; Katharina Leimbach. 2017. “Die (De-)Konstruktion eines extremistischen Weltbildes. Eine Mixed-Methods Analyse von Al-Qaidas Online Magazin Inspire.’ Journal of Deradicalization 11: 148-218. The first issue of Dabiq appeared on 5 July, 2014; the final issue (no. 15) in July 2016. The magazine’s name referred to a Syrian border town, which is the site of a prophesied apocalyptic battle between Muslims and non-Muslims. Maura Conway is Professor of International Security in the School of Law and Government at Dublin City University and Coordinator of VOX-Pol. Follow her on Twitter @galwaygrrl. Michael Courtney is a VOX-Pol post-doctoral fellow. Follow him on Twitter @MCourtneyDCU. This post is an edited version of pp.’s 6 – 7 of VOX-Pol’s Violent Extremism and Terrorism Online in 2017: The Year in Review.